Writing any sort of guideline for kids is always tricky business. Kids are no less unique and different in their ways as adults are and to pretend that one-size-fits-all type of stuff could really apply to each and every child is utter nonsense. What has however worked for me with my child was reading different opinions and various guides just like this one and get a better vibe on whatever the issue to make it easier to form an opinion and – hopefully – determine what could be best for my family. My son is now 4 years old, making it 2 years since he’s had to pay for his own seat on every plane. His first flight (to Croatia) was at 5 weeks old, he was 7 months old when we first flew long distance to Thailand (where we spent the winter at the time). By now he has been to over 30 countries and has been on well over 100 flights. Can you imagine? I think it’s fair to say that I have a thing or two to say on flying with children. 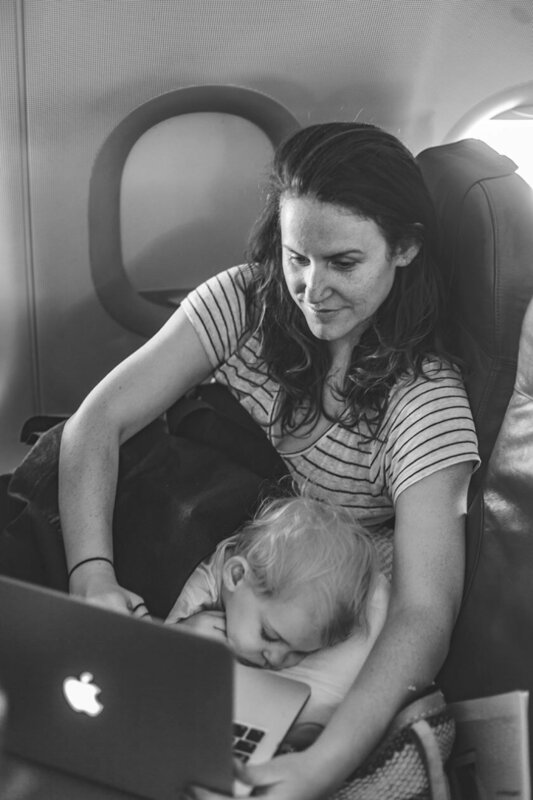 Before becoming a mom I always just booked whatever the cheapest flight available was, regardless of transfer stops and layover times, independent of early departures or midnightly ones. 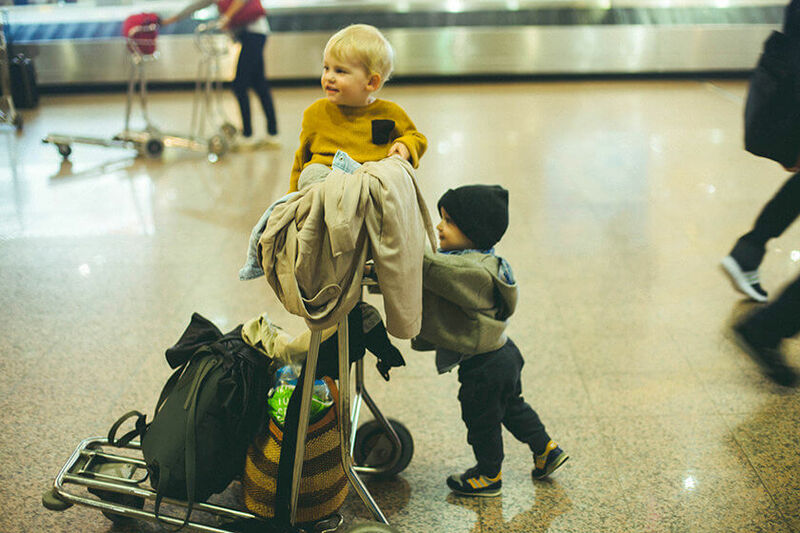 With a baby or a toddler however I developed a perfect system to always strive to book the flight so that it happens soon enough for us to reach the hotel at our destination in time for naptime or evening bedtime. Sticking to sleep rhythms was crucial for us to keep atlas happy and me sane. For long-distance flights I strongly prefer nighttime-flights. My son hates sleeping on planes because he is uncomfortable (despite usually sleeping on me, so who’s uncomfortable, really?). My savior has been to occasionally upgrade us to premium economy, which usually means more leg space, nicer meals and better service. On our recent flight to Bali earlier this year we flew in Premium Economy of Singapore Airlines which was a lot like actual business class (2 nice, big, plush leather seats instead of 3 tight and uncomfortable ones, huge TV screens and incredibly good food) – a massive treat for the stressed parent! I did not do this a few times and always ended up regretting it. Especially on long-distance flights I would recommend calling the airline and discussing with them where you would like to sit. 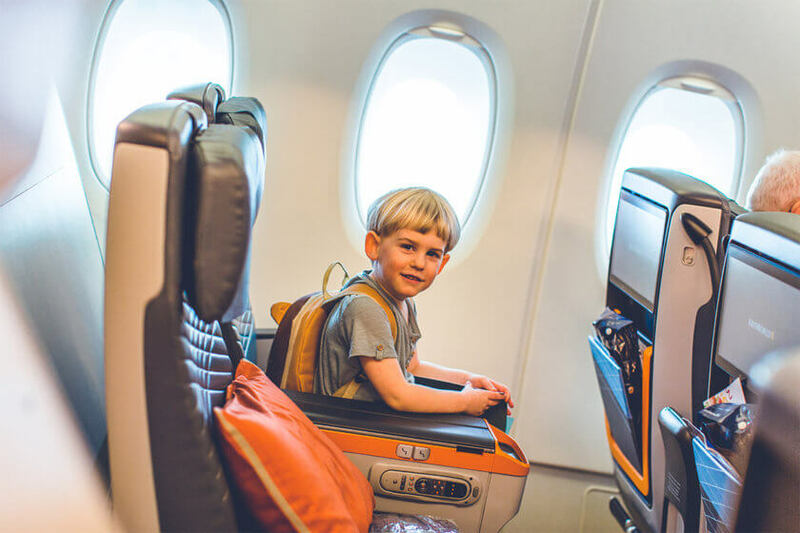 I personally do not like sitting in the “infant row”, that front row that comes with baby bassinets because, despite the extra legroom, the armrests don’t fold up, which can make it quite challenging to sleep with a baby on your lap. On top of that pulling up the TV in those seats is so difficult with a sleeping baby on your chest that I usually wound up not watching any movies and just staring holes into the wall. Finally, I always wanted to sit in the alley with a baby, since my wee one tended to require lots of carrying around or walking around or cleaning up in the bathroom. Not so fun having to ask a perfect stranger to get up 10 times a night. I never quite understood people’s rush to get on a plane. After all, everyone has already been a ssigned a seat, so why queue for 20 minutes when you could sit tight and catch up on some reading? I am usually one of the last ones to get on board, so that my kiddo has a bit more time to run around. Also, being last allows you to quickly assess if there are any full rows available you could move to, in case you’re unlucky enough to have to share your row, or worse: you have a middle seat. 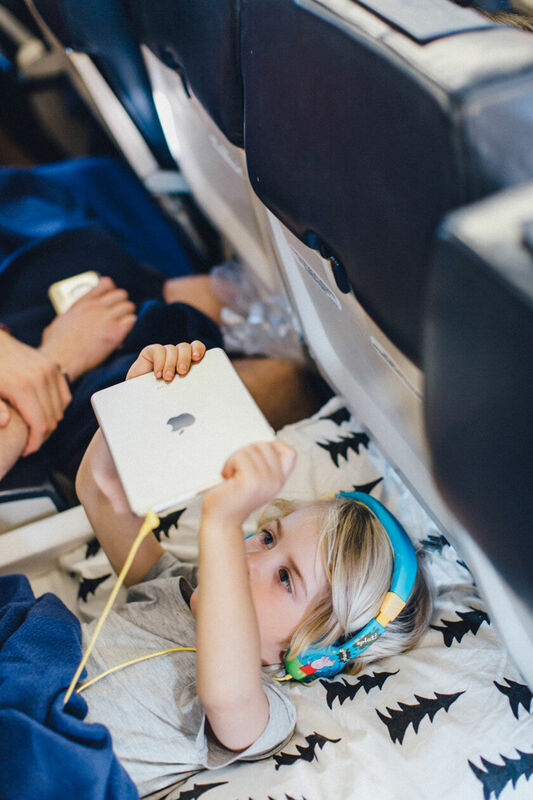 When you have a kid on your lap you can’t easily fold down your tray-table, meaning that you may not be able to have the airplane meal for simple lack of space. And even if there was space, chances your little person throws or kicks it all down are high. Think ahead, pack a sandwich and a bottle of water and just say no to that mediocre airplane food. All hail the pixie book! If you aren’t familiar with those, pixie books are extremely small and lightweight books which tell all types of stories and are a true blessing for the traveling family. My magic trick is to make a whole bunch of brand new books appear on the plane and they can keep my son entertained for a while. I mean, who doesn’t like new books? Reading is part of our night time ritual so what better way of packing in homely rituals on your travels than by some excellent new reads. Mad respect towards parents who manage entirely without screentime. I can assure you that, all good intention aside, this just might be the one time you’ll want to make an exception for the good of your id, your self and potentially everyone on that plane. Why make life hard when you can just pop in a few episodes of Peppa Pig? There is more educational content out there than you are aware of, so download those cartoons and relax. For slightly older kids (from 2) I can warmly recommend installing some apps on your phone designed to engage and educated your offspring. My little man likes any of the Lego Duplo apps, the Sago Mini ones and some of the ones that invite drawing and puzzling. Speaking of exceptions – if there was ever a moment when a sucker could buy you 15 minutes or more of much needed peace, this could be it. Frankly, this is my last resort, but if the big guns are needed, it’s good to have them in your purse. I actually went online and bought sugarfree suckers so be sure I can feel OK about my son’s dental wellbeing. Nice side-effect: suckers are a perfect alternative to breastfeeding and pacifiers for kids who suffer from ear pressure during landing. Raisins and mandarins (which your kid can peel itself) are a lovely little snack that takes a moment or 2 to eat (remember, we are trying to kill time here). Chips are another nice snack on planes, I usually buy the kid-friendly ones without sugar or salt which can be purchased in many supermarkets. Letting the littles walk around is always a good idea. Once he could walk himself I sometimes didn’t even get up with my son any more, I just stayed put and supervised the show with a big grin on my face. When he was just a toddler Atlas loved going around and saying hi to everyone and who doesn’t love a friendly baby? You’ll be surprised to see how many instant babysitters you can find this way and he might meet some other kids to befriend too! These are literal baby steps to independently make friends, interact with new people and fosters self confidence. And whoops! Another 20 Minutes of flight time down. Probably my biggest reason for breastfeeding until 18 months was the freedom this would give on long flights. Not only does this help take the pressure of sensitive baby ears when taking off and landing, it also has a calming effect on the child in exciting travel times and helps them fall asleep, even when the lights are on and there are many new faces to discover. Are you trying to raise a good flyer? Condition your child into being just that by surprising him with a special goodie bag you made just for the flight. Put in small toys, stickers, pens, coloring books, puzzles, whatever your junior might enjoy. I once bought a bag full of old matchbox cars at a yardsale and would bring them on planes in a ziploc bag. They not only kept Atlas busy for a while, he also quickly gathered an audience of other kids that wanted to play, too. I call that a parenting win! Do you have any more tips for flying with small children? Share them in the comments!